It makes Cranky cranky to have to repeat himself, Cranky is not a Clown! Laziness Cranky will give you the benefit of the doubt that you are just too lazy to speak two extra words. You know how people tend to shorten names, calling somebody named Joseph, Joe, or a Jennifer, Jen, without considering if they prefer the longer name, their actual name. Or perhaps you never noticed Cranky's… Continue reading It makes Cranky cranky to have to repeat himself, Cranky is not a Clown! Equipment Failure – Achievements in the Pathetic. Cranky’s seasons have a long tradition of ending on a sour note, so to speak. There was the time that Cranky was playing in Congress Square on a cold Friday evening toward the end of October. 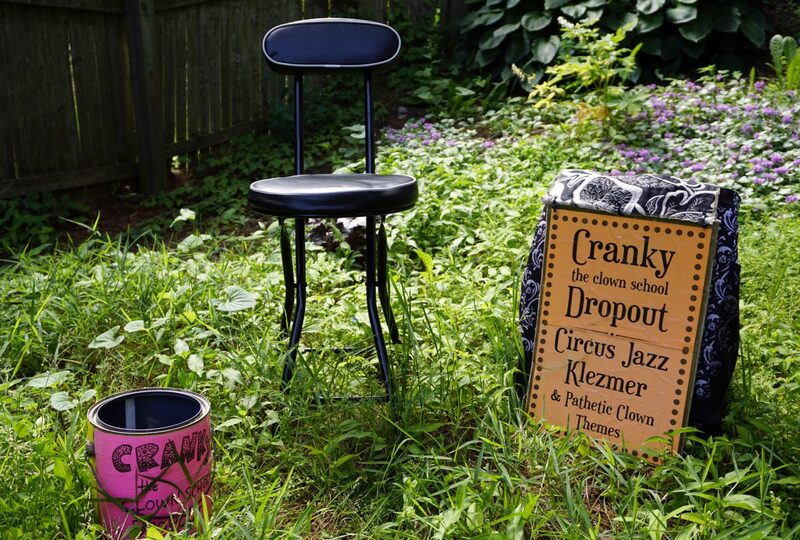 A derelict fellow came up and insisted that that he should have a dollar out of Cranky’s bucket. When… Continue reading Equipment Failure – Achievements in the Pathetic. A brief peek into Cranky's brain. Here’s a behind the scenes story of Cranky’s that you are probably better off not knowing. So for all of you who have a rosy image of Cranky out there wearing his multi-colors, in a sax playing utopia, you can stop reading right now. No need to dirty up… Continue reading Cranky’s dream comes true, a bad dream that is. This is your Cranky on Ellington. Another Cranky inspiration. Long time member of Cranky's playlist is Everybody Stomp by the Cotton Club Orchestra (Duke Ellington). http://youtu.be/2rl6zY4Wcz4 Cranky likes songs that offer much more than appears on the surface. Sort of a, the whole is more than the sum of its parts, but inverted. The parts are more than the whole. So… Continue reading This is your Cranky on Ellington. Cranky is in the basement, listening…listening. Cranky's Winter Hiatus is in full swing. But lest you think that Cranky is presently lounging on a Florida beach, consider that his work ethic would rule out such indulgences. Cranky's idea of taking time off is to work on new material. A frequent ear out for songs in the circus jazz vein has the… Continue reading Cranky is in the basement, listening…listening. Cranky’s last day of 2014? Cranky was graced by a ton of his fans this morning at the Deering Oaks Farmer's Market. On this uncharacteristically warm October day there was good cheer felt by all. This could very well have been the last appearance of Cranky for 2014. One of Cranky’s mottos is “it’s good to go out on a… Continue reading Cranky’s last day of 2014?